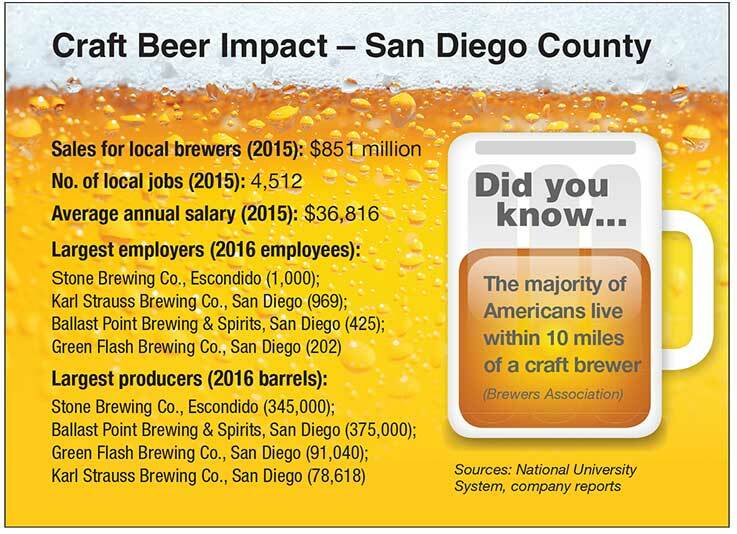 Originally published April 27, 2017 at 12:43 p.m., updated April 27, 2017 at 12:43 p.m.
Jim Crute owns and operates Lightning Brewery in Poway. He recently tested the waters for a possible sale of the company, but couldn’t find the right buyers. He is now downsizing parts of his operation and refocusing on customer service and brewing. Photo by Jamie Scott Lytle. 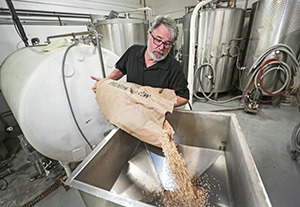 Jim Crute adds malted barley to the mix at his Poway brewery. He says it has gotten easier to start a brewery but tougher to keep one profitable. San Diego  Brewers like Jim Crute, who has owned and operated Poway’s Lightning Brewery for the past decade, are finding that this is a critical time to assess their place in a craft beer industry where growth is slowing, and where retail shelf and tap space is getting increasingly tough to conquer. Do they stay small and local? Plow considerable money and effort into growing their regional and national sales footprints? Or simply get out of the business? All of these options occurred to Crute, 58, who in December decided to place Lightning Brewery on the market for potential sale. Posting in places including Craigslist and the national beer-news publication Brewbound, his hope was to find someone willing to buy his operation outright, or add his brands like Lightning Thunderweizen to that brewery’s stable of offerings. Most of the responders, Crute said, were “looky-loos,” many of them without the required financial resources to seriously take on a new company or brand. After recently seeing diminishing returns on his own retail distribution efforts — which contributed to his company producing around 800 barrels in 2016, down from 1,200 in 2014 — Crute decided to stay in the game but maintain a micro or nano-brewer’s approach to a craft that he still very much enjoys. A veteran researcher in the life-science and pharmaceutical industries before deciding to move into beer — starting like many locals with a home brewing hobby — Crute said he will now focus on selling direct to his customers through his current on-site tasting room in a Poway industrial park, along with satellites that he may add sometime in the future. Taking a page from the playbook of small vintners and wine clubs, he will also be selling straight to buyers through online and other direct-sales channels that don’t involve significant participation by third-party distributors or retailers. He’s looking to downsize on the storage, distribution equipment and other costs associated with selling his beers in supermarkets and other retail outlets during the past few years.